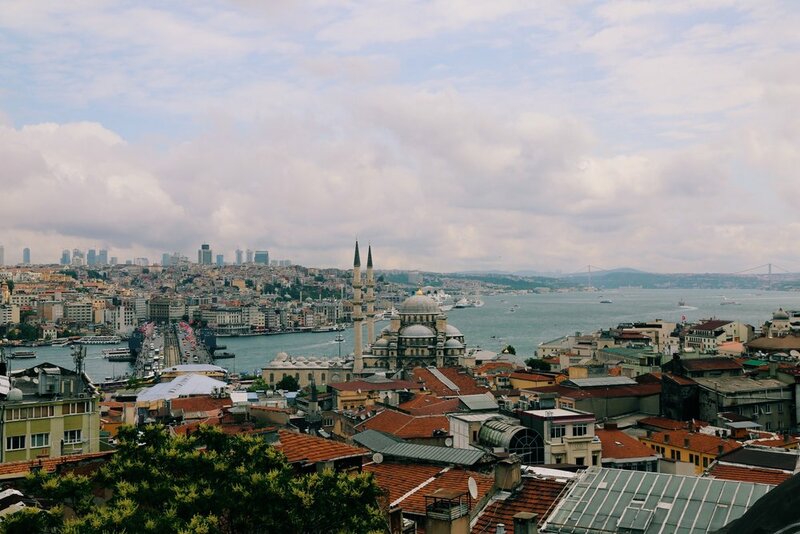 With four days notice, Brooke and I packed our bags for Turkey to join our dad's longtime friend and movie producer who was shooting a movie in Istanbul. 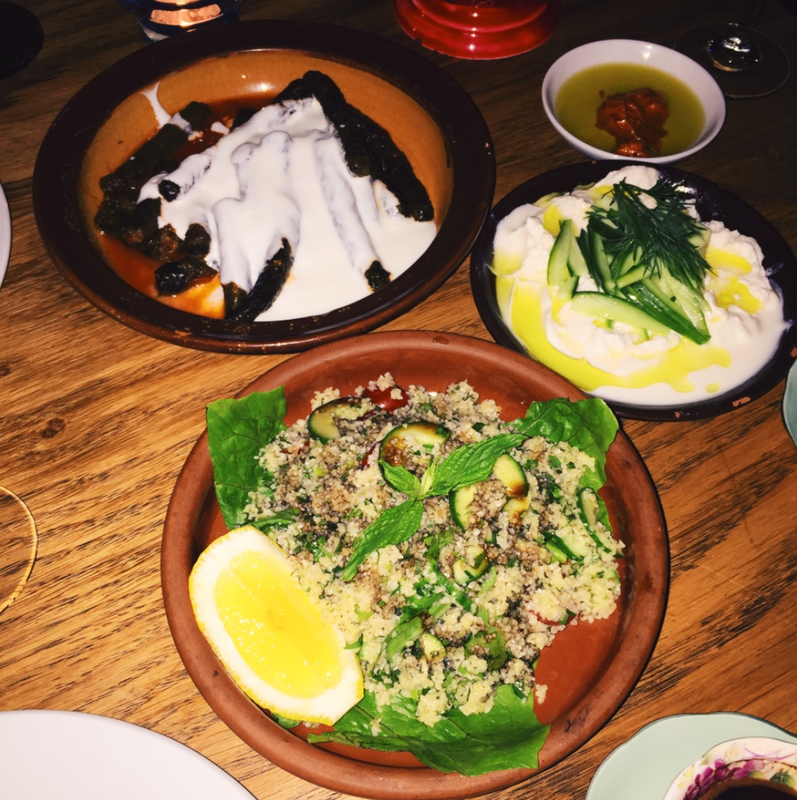 After an easy flight from Amsterdam, we arrived in Istanbul just in time to eat dinner for breakfast at Naïf and it took copious amounts of Turkish coffee in attempts to beat our jet lag. 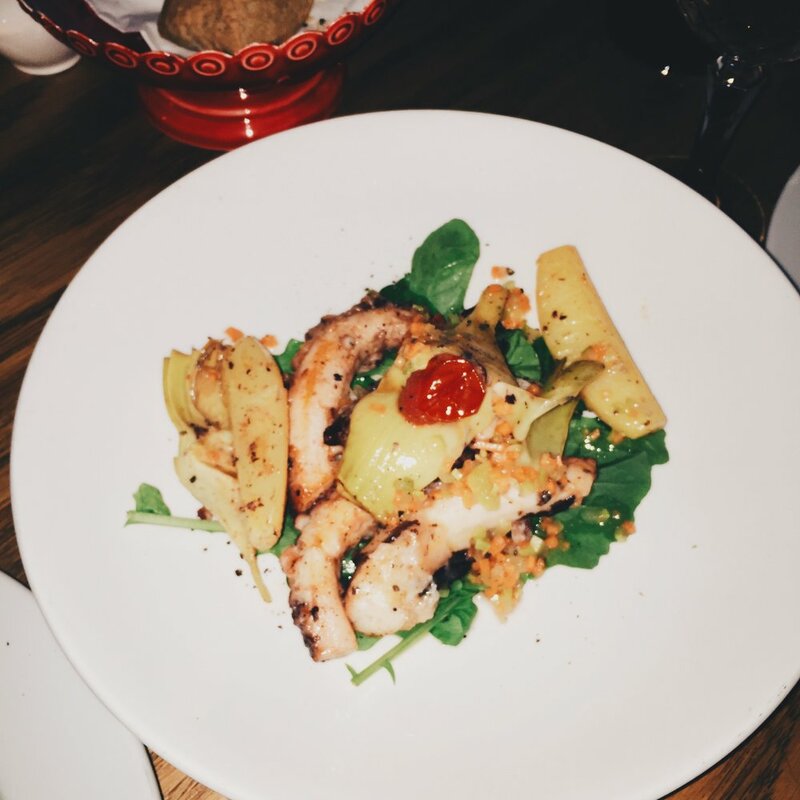 This place became the restaurant we frequented during our stay + the go-to order included: grape leaves, tabbouleh, strained yogurt with cucumber, and grilled octopus with artichoke hearts and potatoes... Obviously our Lebanese side was thriving with the food here. 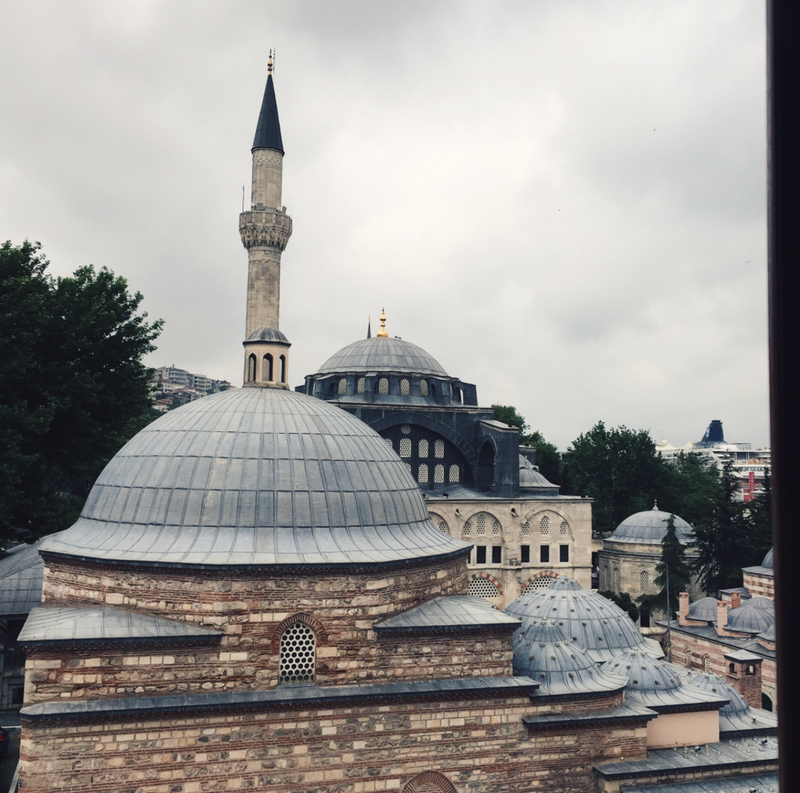 The next morning, we were abruptly woken by the loud prayer bells coming from the mosque outside our hotel room window, so close we could almost touch it. 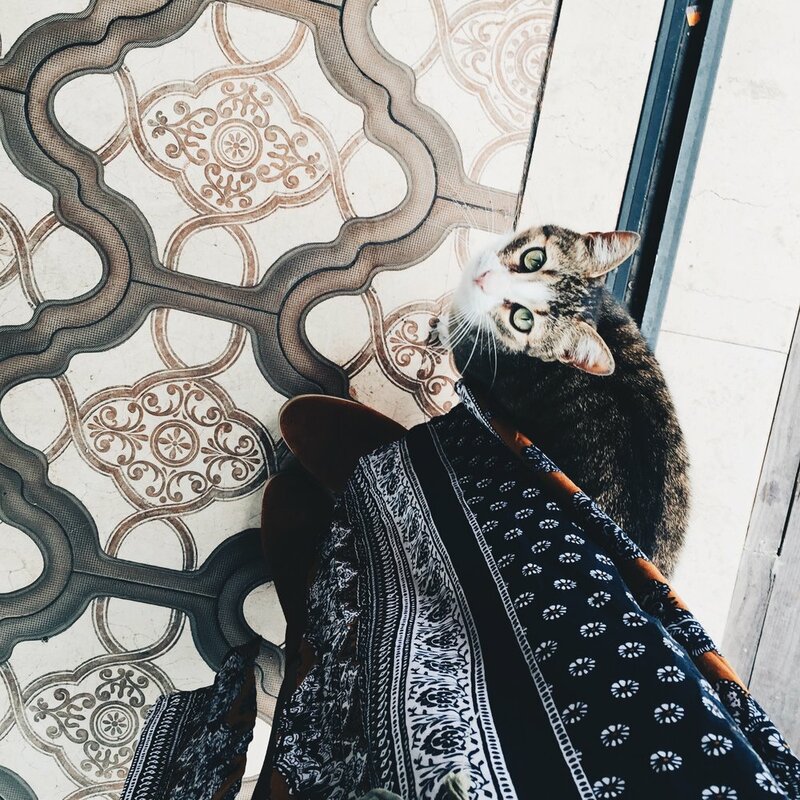 Symbolizing a religious and cultural ritual that is hard to ignore. This magical moment reverberates the entire city, five times daily, starting before dawn and ending long after dusk. There are many unique elements that make up this country but nothing compares to a Turkish 'serpme kahvalti' or breakfast spread. Every day our hotel staff immaculately placed each plate of food propping them up with old books and other novelties for an old world feel. 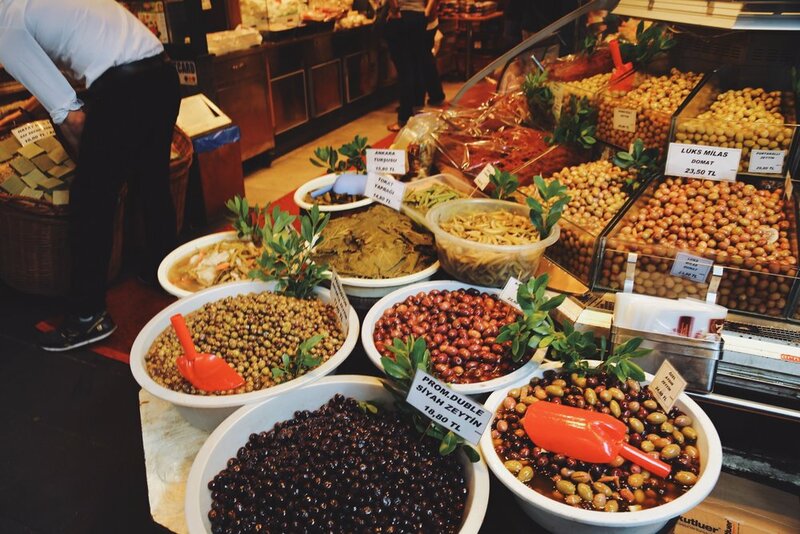 A traditional Turkish breakfast includes tomatoes, cucumbers, olives, fruit, jam, fresh butter, honey, Nutella, meats and cheeses, boiled eggs, and various flatbread. 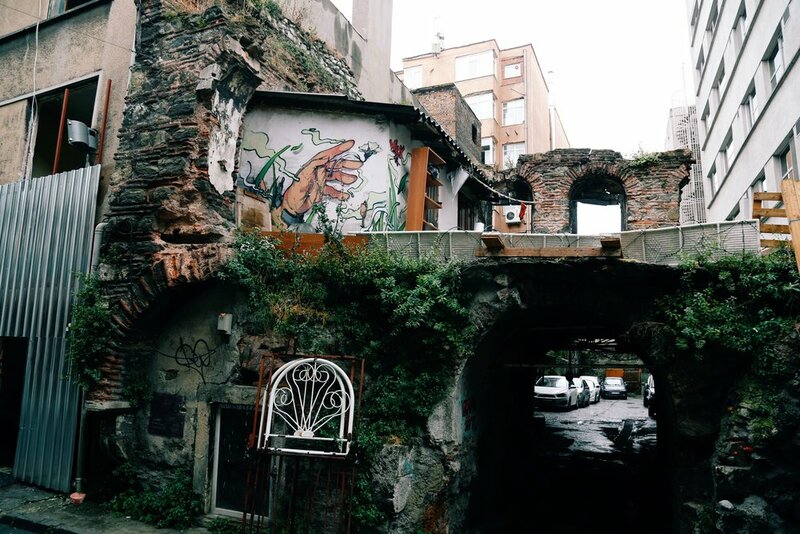 Istanbul is an easy place to explore by foot, thanks to the Galata Bridge, connecting the two sides of the city. 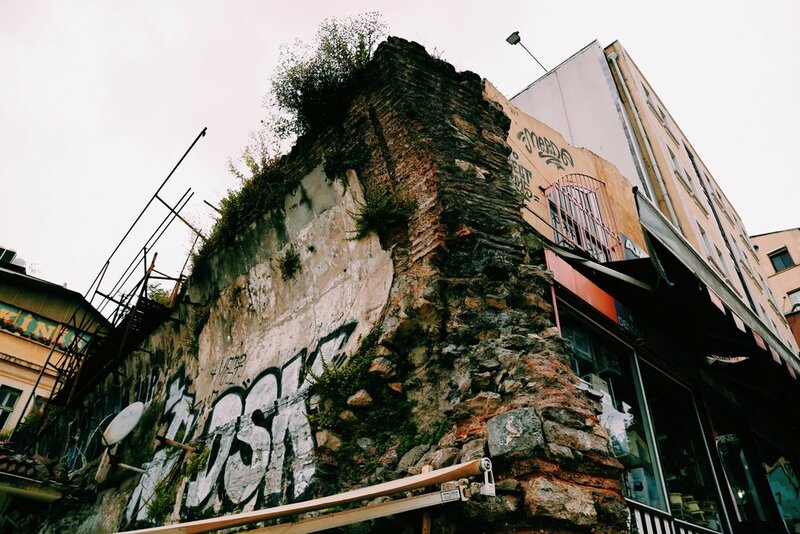 Before shooting began on the movie we were able to experience Istanbul from a totally different perspective than the average tourist. 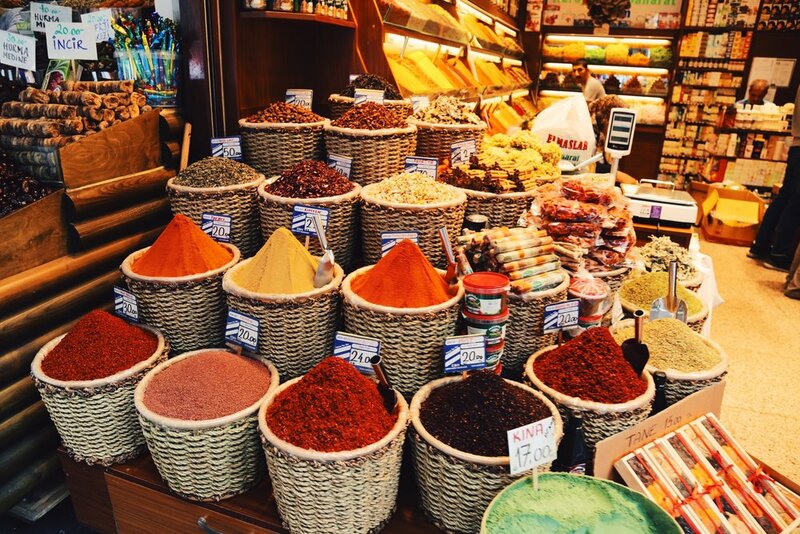 Wandering through The Grand Bazaar, one of the largest and oldest covered markets in the world holds easy-to-miss restaurants and shops that are wonderfully otherworldly. 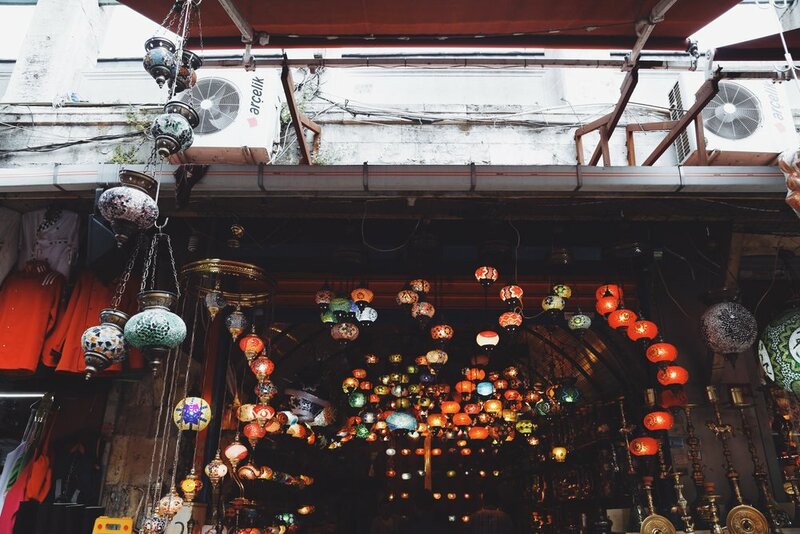 Gorgeous rugs hanging through the streets, hand-blown glass lanterns, spices of every color imaginable, this was a place of instant inspiration that changed our Gilded Arrow journey forever. 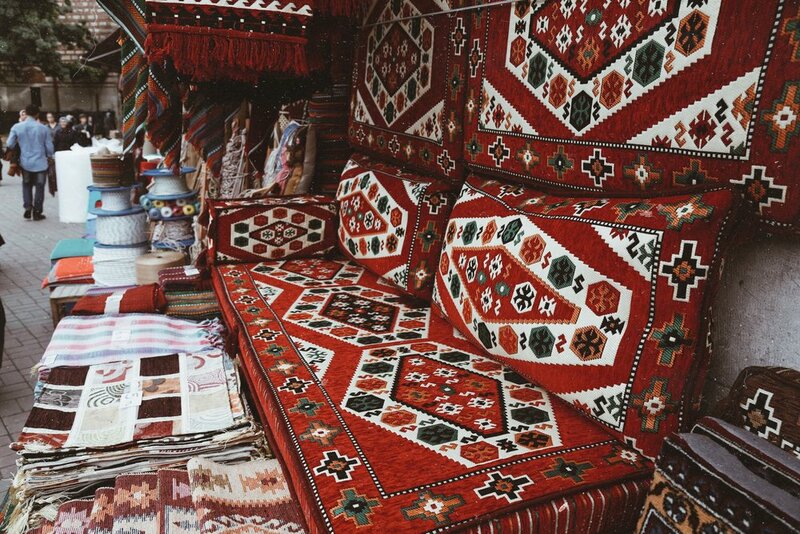 It was during this trip, that Brooke and I felt Turkish cotton for the first time... part of us instantly felt the need to hoard these textiles and keep them a secret between ourselves but the other part of us knew we needed to share this with the world & the rest is history. The second most amazing part of the trip was when we were guided by a local friend into a small, dark portal and up a flight of stairs that lead us to the roof. 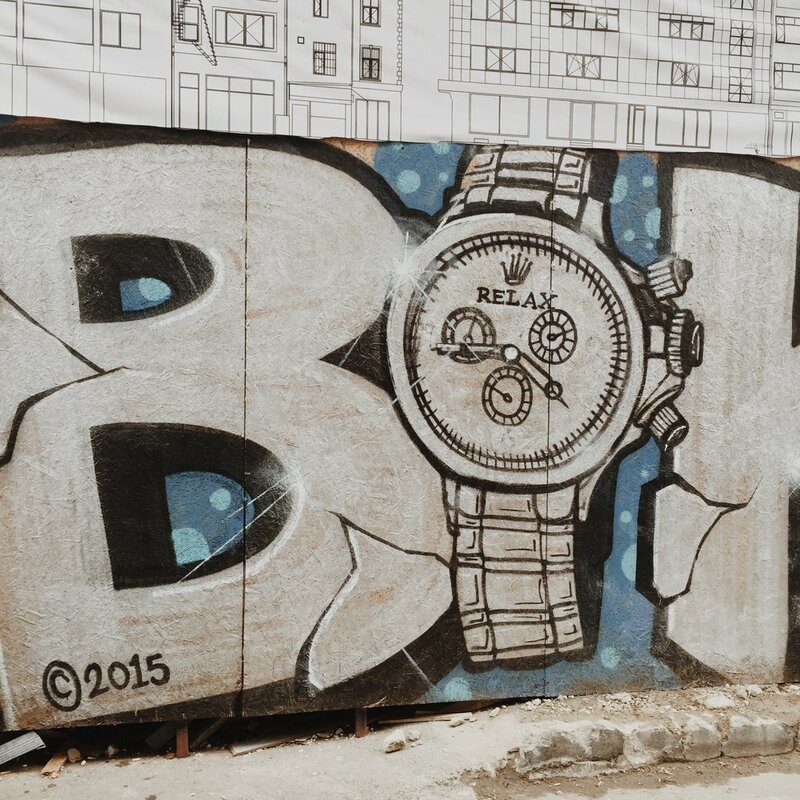 From there we were surprised with the best view in town, a 360-degree view of Istanbul and some memorable graffiti. The Bosphorus Bridge unites the European continent to the Asian continent on the other side. 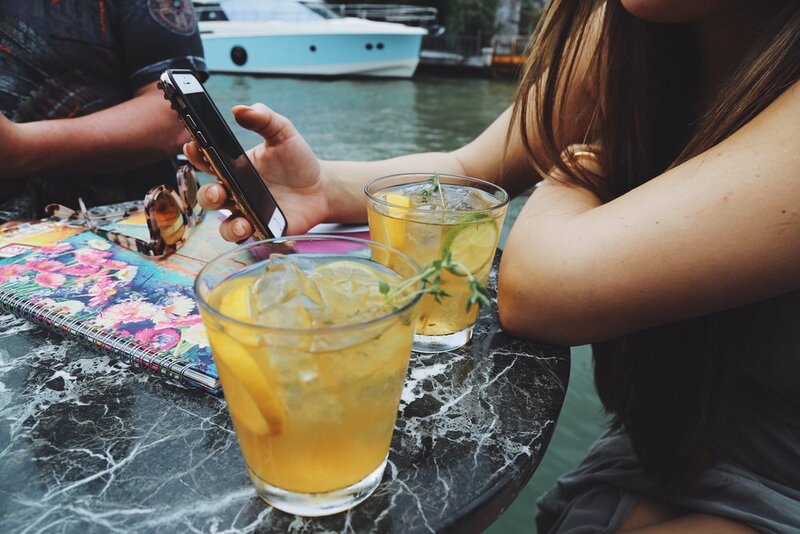 One afternoon we rented a boat after lunch at The House Cafe to take an impromptu adventure to the Asian side of the Bosphorus Strait for good measure. The architecture was drastically different than the European side with an obvious presence of Japanese style. 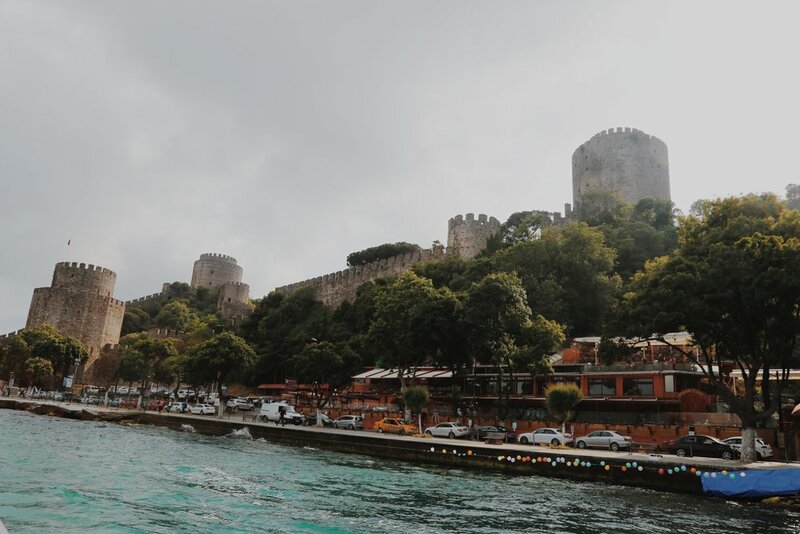 Close by sits the Rumelihisari Castle, a Sultan fortress that was built in 1451 to control sea traffic and today, remains frozen in time. 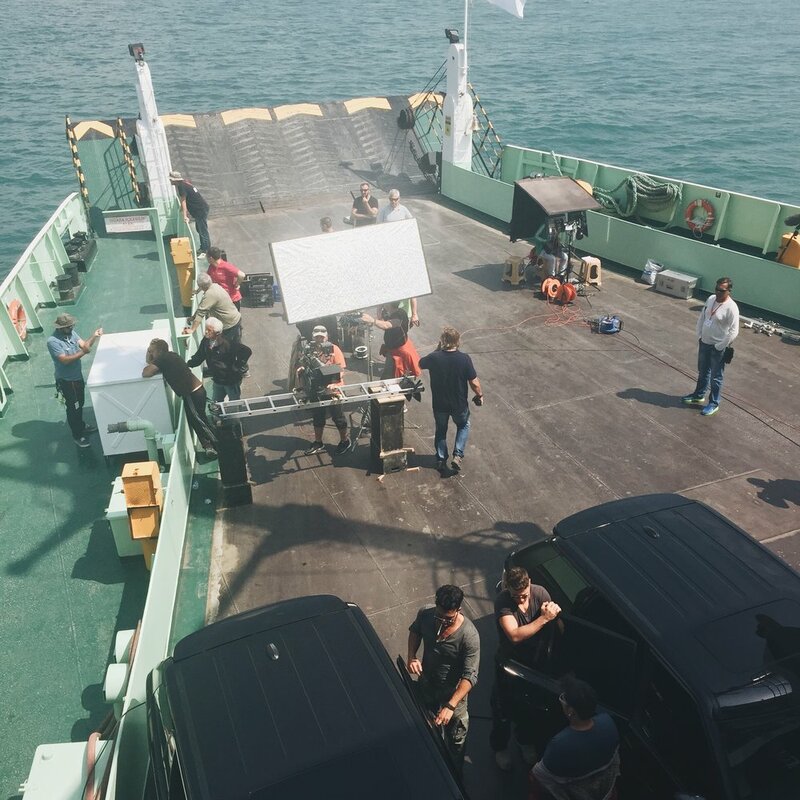 We spent six hours floating around the Bosphorus Strait on a ferry, shooting a scene for the movie, which was a truly rare experience. 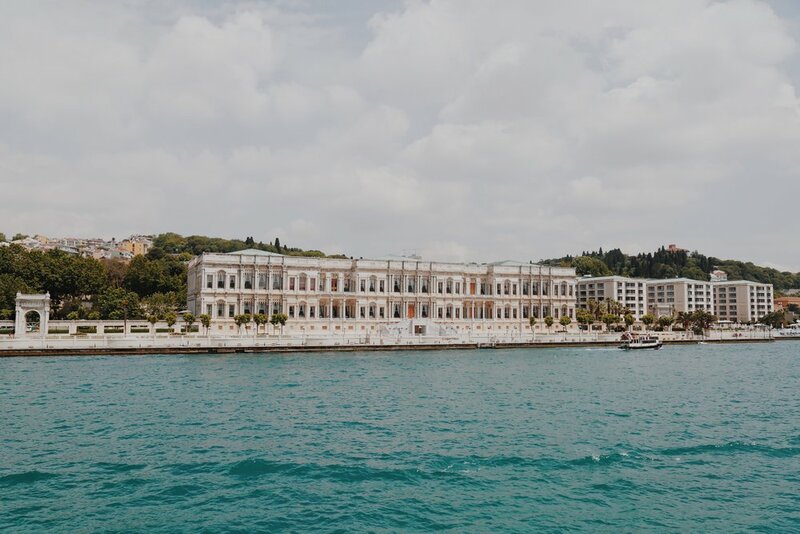 We also visited a man-made island that sits between the two continents on the Bosphorus, called Sauda Club. 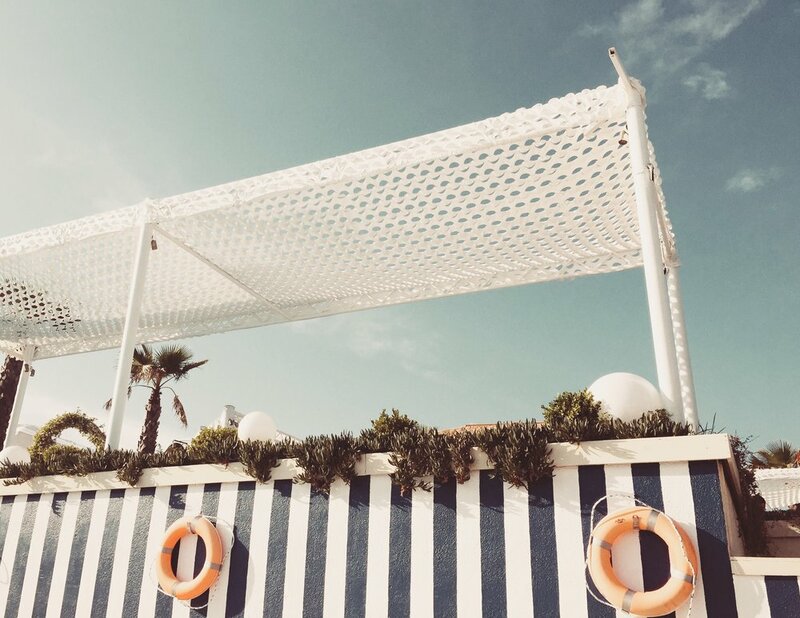 It’s open during the day as a day club with a pool and countless hip restaurants but is known for its nightlife when the sun goes down. 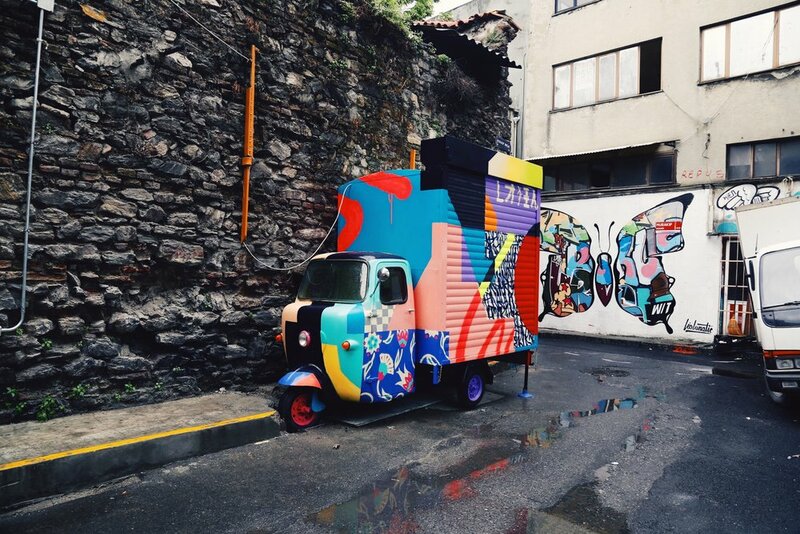 My favorite thing about Istanbul was its history, how the city is so ancient yet it has become this modern and artistic hub painted with vibrant colors everywhere you look. 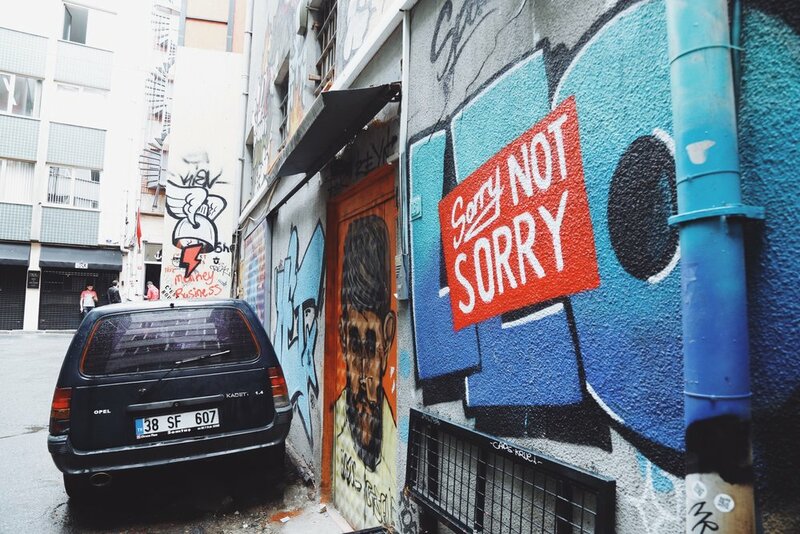 Istanbul's street art was unlike anything I'd ever seen. 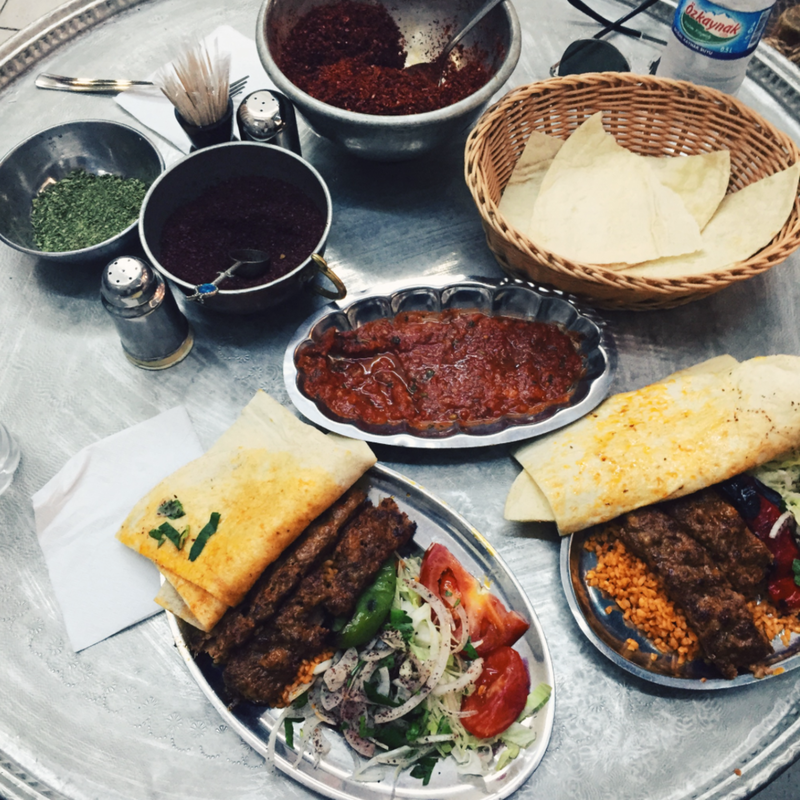 Of all the amazing food I consumed my favorite meal was when I stumbled upon a nondescript and authentic döner wrap shop deep inside the Spice Market. You sit low to the ground on mini tin chairs and watch the man make your meal. During the trip, I worked with the main photographer on set to capture stock photos during the week. 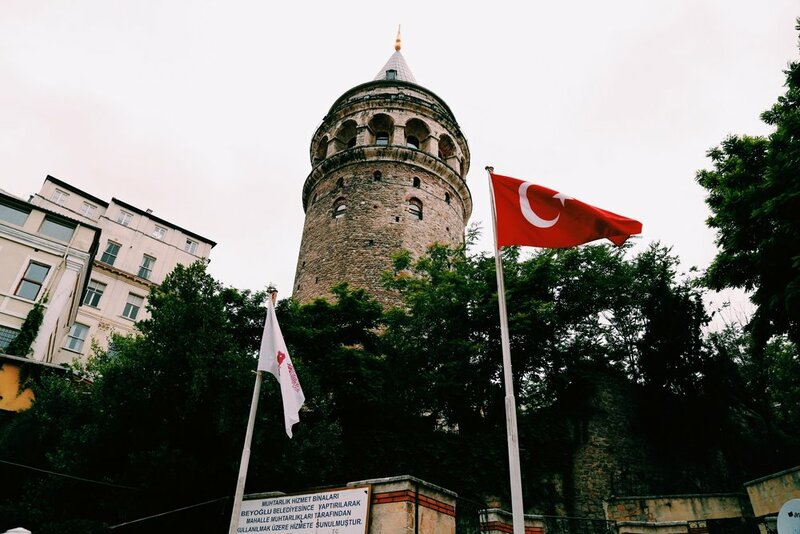 We ventured to the Galata Tower, a medieval stone tower built in 1348 by the Byzantines. First used as a lighthouse, it's now a historic landmark of the city. 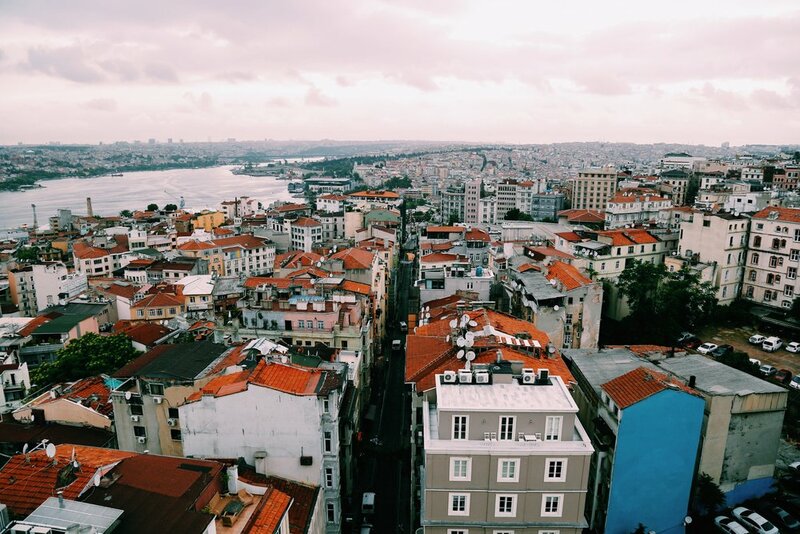 After climbing the never-ending spiral staircase awaited the most breathtaking view of Istanbul’s entire skyline. 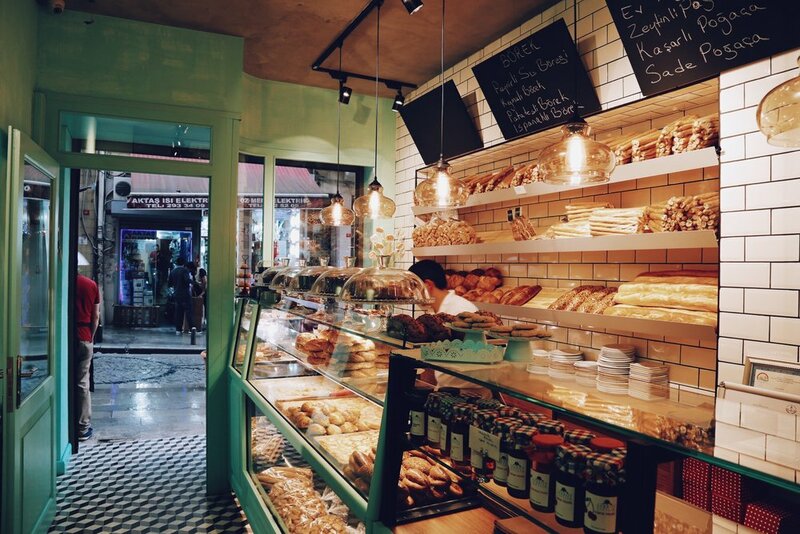 Shortly after it began pouring down rain, so we rushed back down with haste and into a delicious smelling bakery permeating the smell of flaky pastries for shelter. 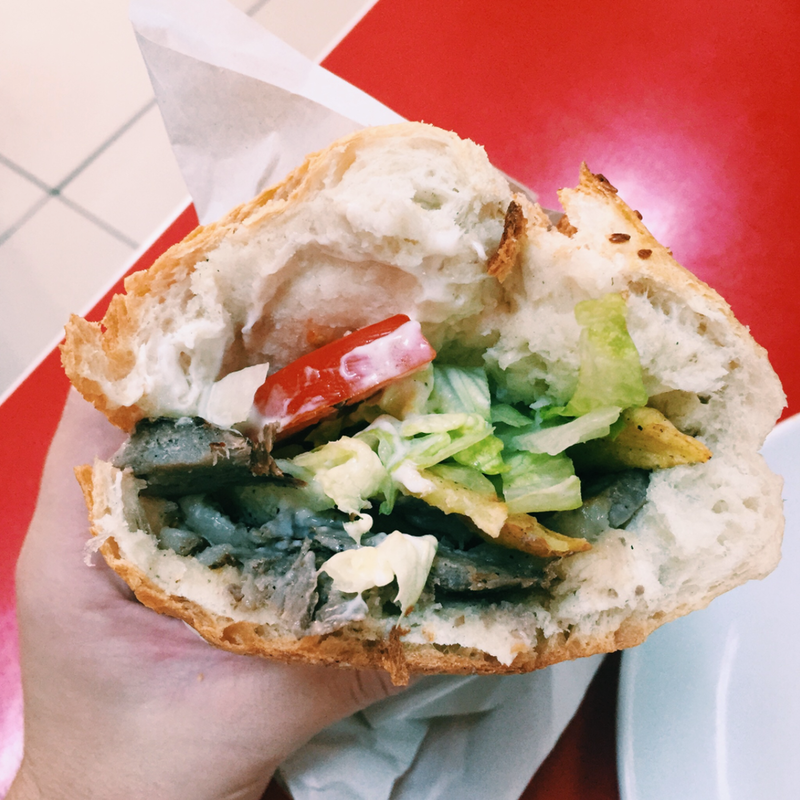 Next, we found a Turkish baguette vendor selling crusty sandwiches filled with döner meat from the traditional vertical rotisserie, slathered with mayo, stuffed with lettuce and tomatoes and french fries are also thrown in, which is apparently not just some Americanized fantasy. Another scene was filmed in front of the Blue Mosque at five in the morning to avoid the NYC-like crowd that commences any later. Each famous mosque looks similar from the exterior but inside tells a very different story. These mosque's intricate details created the closest thing to perfection I've ever seen. 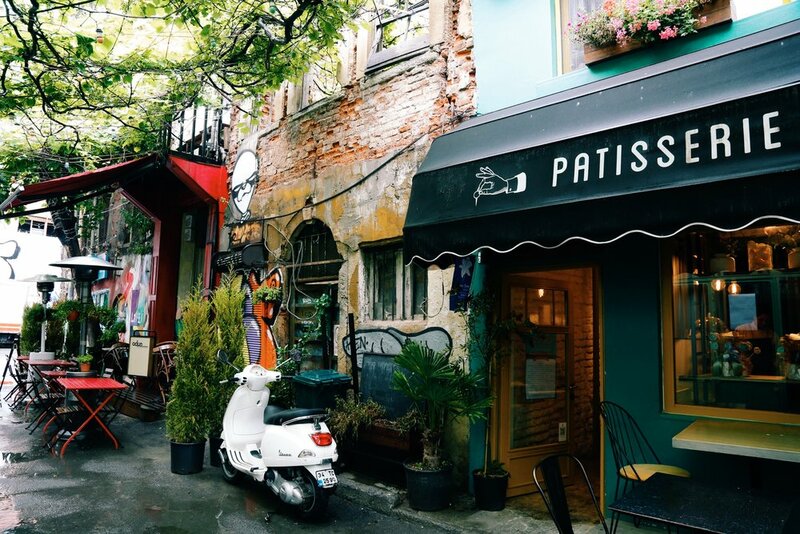 There were plenty of amazing restaurants in Karaköy, the neighborhood we resided in. One of which served Ottoman cuisine. Sitting outside we dipped bread into cold mezzo (or appetizers) of eggplant and spinach dip and melt-in-your-mouth pot roast. Another great spot was Tükkan, an adorable multi-level cafe serving a delicious, cheesy mushroom crepe, that we washed down with passionfruit cocktails. 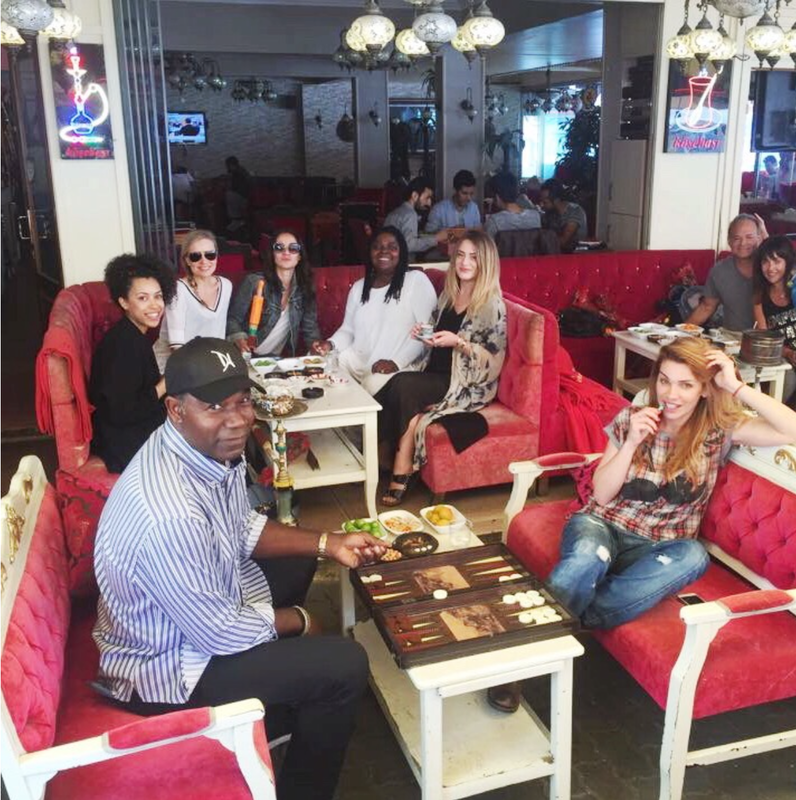 Last but not least, my guilty pleasure of Turkey’s culture: Hookah lounges. 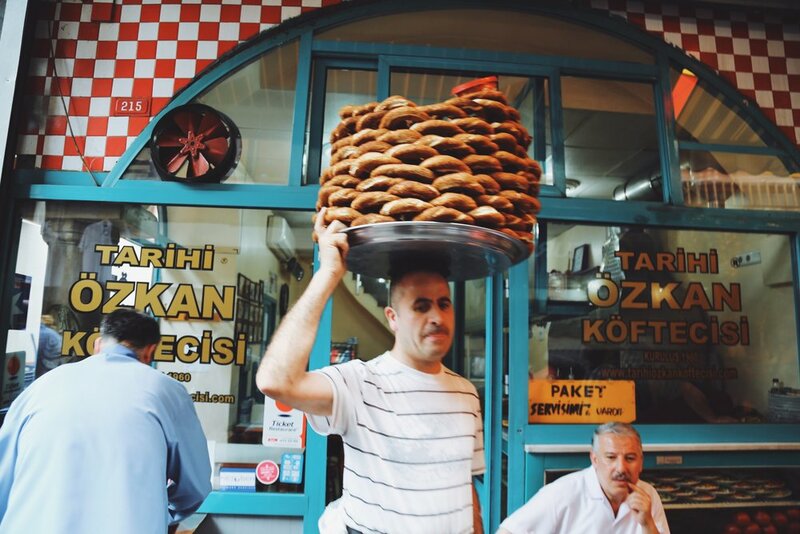 Known here as nargile cafe's, they are as common as Starbucks in the States and placed on just about every street corner. Entire families sit around and enjoy each other's company for hours. 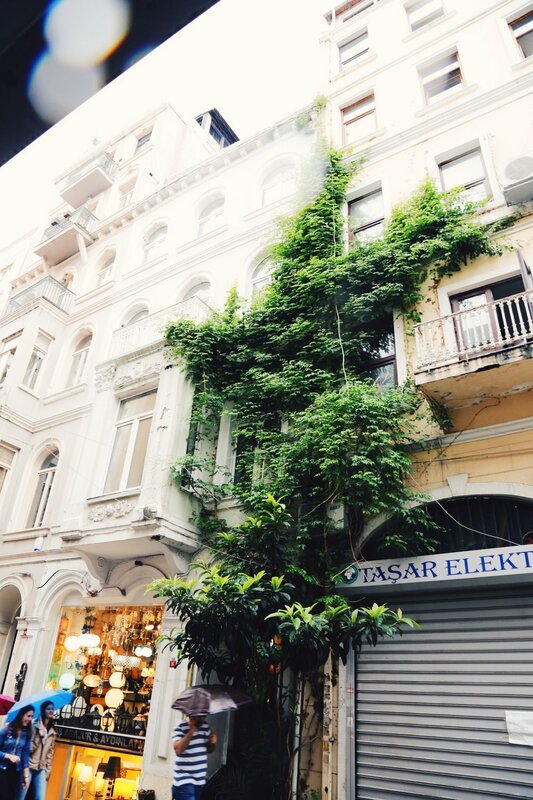 I will never forget the nargile cafe across the street from our hotel that served authentic döner and menegiç (pistachio flavored Turkish coffee) accompanied by Turkish delights, and complimentary fresh fruit and nut plates. This became a place where we got to know new people and bonded over embracing a new culture to the beat of hip swaying music. Tükkan, Naif, The House Café, Turkish Coffee, Menegic, Classic Döner, Turkish Breakfast at Kale Cafe, Manti, Çiragan Palace for apple tea, Mahmut Usta OsmanlI MutfagI for Ottoman mezze.